Posted May 29, 2018 by Caroline Preece & filed under Features, Headlines, Reviews. Warning: Spoilers for Westworld season 2 episode 6 lie ahead. 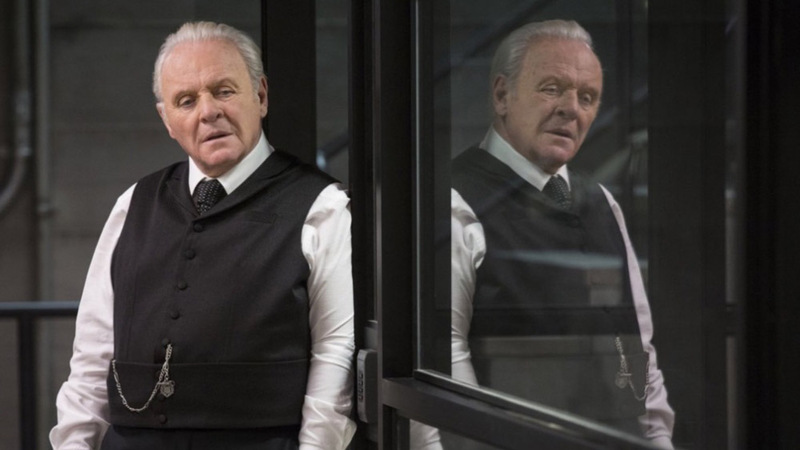 Much like a cat plays with a mouse (or a greyhound plays with a felt rabbit), season two of Westworld has put forward the notion that Robert Ford – the riddle-fluent co-creator of the park and apparent mastermind of the current rebellion – might have done it all just to drive one man to madness/enlightenment. While Arnold’s game went the really, really long way around trying to wake Dolores up to her own reality, Ford’s is to reveal some larger truth to William aka the Man in Black. By doing so, he’s also led us, the viewer, down a rabbit hole or two, and one of Westworld’s greatest tricks came at the end of episode six, Phase Space. In order to create as much chaos as possible, Robert uploaded himself ‘The Cradle’ – a perfect, untouched, digital version of the park we saw in the pilot. Doloros dropping the can, non-psychopath Teddy picking it up and a player at the piano. But this time the player is Ford, and a digital version of Bernard is there to meet him. What this means is anyone’s guess, but it’s one neat magic trick. What the twist does is use internet fandom’s sleuthing against it, with the fact that Anthony Hopkins was out of the show save for a few voiceover snippets completely taken for granted. The character has been CGI Hopkins appearing in misty windows, a creepy child host and various other avatars – making the actor’s reappearance on screen all the more surprising. Just ten years ago, while Lost was airing if you will, knowledge of casting and contracts was much harder to come by and far less interesting fodder for the theorising masses. The usual screencapping and message board scrutiny was present and correct, but knowledge of who was going to be in which episode and when was not as common knowledge as it is now. And let’s not discount the fact that this episode was the first not to be sent to critics by HBO beforehand. For those of us watching along with the general audience, this levelling of the playing field is always a thrilling moment in fandom. It’s usually finales and big reveal episodes that are given this treatment, so we should have known that something was coming. Thankfully Ford’s presence doesn’t undo his death at the end of season one, but rather incorporates him into the fabric of the parks he devoted his life to. That’s a far more interesting take than the ‘a host Ford was the one who died’ theories, because it introduces us to a brand new concept before grounding it in something we know just ten minutes later. The execution of Westworld season two’s big ideas has so far surpassed anything attempted in the first run of episodes, but perhaps this – along with the Reddit Rick Roll before the season even began – truly shows how far its willing to push the mystery box drama into new and exciting territory. Instead of trying to stay one step ahead of viewers, Westworld is using our own hubris against us.